Emerging Tech Ed: December 15-19 - Extensions!! When you bookmark a site now, it will say "Bookmarked" (1) and also give you the option to "trash" (2) the bookmark as well. 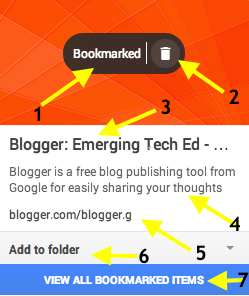 At this point you can change any of the descriptions of the bookmarks including: the title name (3), the site description (4), change the URL (5), add to a folder (6) or even view all bookmarked items (7). If you click on "View All Bookmarked Items" you will see a page that looks very similar to your Google Drive page...We can almost consider this Google Drive for Bookmarks!